I'm sure many of us have come across people at work we'd rather not have. Sometimes we can work around them but very often we let them get to us. The same can be said for "friends". I learned the hard way and in the end, I ejected them from my life - one less thing to worry about and it worked despite it being emotioanlly very trying at the time. 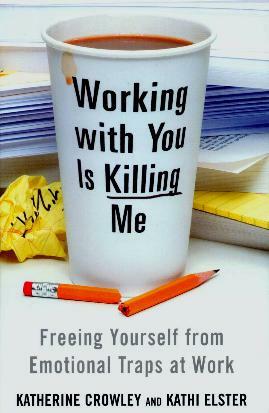 Authors Crowley and Elster (psychotherapist and small business expert, respectively), say in their introduction, "This book will help you "unhook" from any emotional pitfalls in the office and show you how to manage difficult personalities on the job", and "This is not a quick-fix book but a handbook for your worklife". They talk about "unhooking" yourself in the workplace, physically, mentally, and verbally. No matter how difficult it is, we've got to calm down before we try and sort the situation out - I know, because I used to be this person at work. They discuss personal boundaries at work which applies to all of us, and how we can cope, by taking action to improve things. My solution is that if only parents would teach their children how to treat other people, how to speak properly and respectfully to other people, to be courteous to others, and basic good manners, life would be so much more pleasant all round. This book will also help people identify themselves as the culprits in business - the space invaders, the gossip, etc. Will they ever think they're in the wrong, and want to change? I doubt it but you just never know. I didn't finish this book - it didn't capture my interest and I thought it too full of "steps" - too many, in my opinion. Perhaps over-analysing things - there's just too much information and too many scenarios to cope with. If you need all this information, you're not ready for the world, nevermind the workplace. Conclusion - It's sad that such a book had to be written - what happened to consideration, morals, and just plain common decency?